One man's rate went from 9.5% to 16.99%: "It almost borders on loan-sharking"
(CNN) -- It arrived in Rich Stevens' mailbox a few weeks ago: the notice that Citibank had "rate-jacked" the Visa cards belonging to him and his wife. 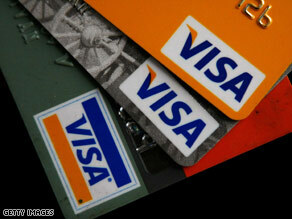 Some credit card holders have seen their interest rates go up dramatically, a practice called "rate-jacking." "In my case, from 9.5 percent to 16.99," the 54-year-old nurse from the Long Island hamlet of Merrick, New York, told CNN. And his wife's rate zoomed from 7.95 percent to 16.99 percent, he said. "It almost borders on loan-sharking, from my perspective," he said. In the blogosphere, writers are livid at the instant rate hikes -- called "rate-jacking." Citigroup seems to be the target of most bloggers' venom -- partly because Citigroup issues so many credit cards and partly because Citi began sending the notices at about the same time it was getting a $20 billion, taxpayer-financed government bailout. No one at Citigroup would talk on camera to CNN about the matter. Instead, the company issued a written statement, which said: "To continue funding in this difficult credit and funding environment, Citi is repricing a group of customers." Citi told CNN that anyone unhappy with the new rates can opt out and continue paying the lower interest, but they must close their account when their card expires. It's all in the fine print. "They have this provision that says they can raise the rate -- any time, any reason," she said. In September, Maloney got the House to pass by an overwhelming margin of 200 votes the "credit card holders' bill of rights," which would have stopped rate-jacking and the imposition of other fees by banks. The chairman of the Senate Banking Committee is Christopher Dodd. His staff said the Connecticut Democrat has his own credit card bill containing tough language to stop things like rate-jacking and shortening of billing cycles -- two issues that anger consumers. But even Dodd's own bill has failed to gain traction -- it has sat since July. Dodd himself received more than $4 million from the financial sector during the last campaign, according to campaign records. His office did not respond to CNN's questions about that. It did say that he has tried repeatedly to protect consumers, but added, "legislation has been met with stiff opposition by the credit card industry." On Thursday, the Federal Reserve is expected to vote on its own new rules regarding credit cards, rules in the works for four years that could clamp down on rate-jacking. Whatever is passed, Maloney said, probably would not take effect until 2010.